Oscar is an energetic, playful dog. My Maltese Poodle mix rescue loves children and babies, while always being very exited to see any young children, as soon as he is near one he is calm and acts like a perfectly trained dog (if only I could take the credit, and he were always that way). He is so loving, with hazel eyes, a pink nose, and a smile, that lights up my day. Oscar was a rescue pup, and one of the best things to happen to my life. 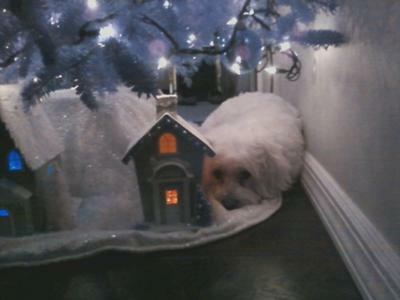 I love my Maltipoo puppy. I have a dog same as yours Named Benji. He is nearly five months old same colour, but has a brown nose. He is a very clever little dog ,does his road drill sits up and begs.Loves every visitor that comes. Loves to play with his ball. My Maltese Poodle mix rescue Molly is the most wonderful, kind, good natured dog ever! She loves everyone and as long as she is with me, she is happy! She is a rescue, I can't believe anyone left her at the pound, but they did. It wasn't just Molly's lucky day when she came home with me, it was mine too! My rescued Maltipoo, Molly, has been with me for 2 1/2 years, she is about 6 years old. When I went to visit family in Florida this past Christmas, my neighbors offered to keep her at their house so that she wouldn't have to go to the kennel. First she was thrilled about it, then, as she missed me more and more, as you can see in this photo!!! This is our Maltese Poodle mix rescue. We just adopted this amazing Maltipoo! 3-1/2 years old (we think) and such an intelligent little dog. He is amazingly well behaved and loves to cuddle! Our first dog and such a joy! Looking forward to many great times! 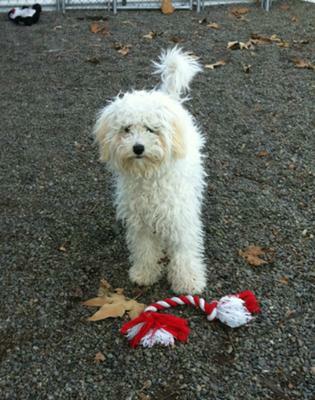 We have been trying to adopt a Maltipoo rescue for months. None can be found. Our pound has only Bull terriers. How did you find yours? We live in Jackconville, FL. And what dogs were available through rescue are sent out of state. Lily is a Maltese Poodle rescue shelter adoption and although she has only been with us a few days, she is fast becoming a lovable and wonderful addition to our family. She is 6 months old and seems to be a quick study. She is working on outdoor potty training as she was paper trained. I'm sure this is a little confusing to her but she is making the most of it. 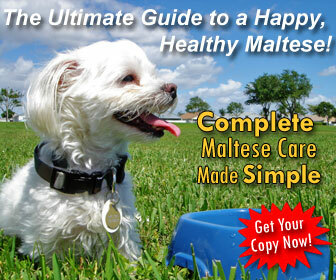 Our Maltese Poodle mix has a strong personality and a mind of her own. We are working to maintain her spirit and gently guide her to be more in line with our family schedule. She has picked up a bit of a bark-I think from her time in the shelter but we are giving her soft corrections and positive reinforcement. She is destined to be the heart of our home. We have just moved from the U K with out daughter,son in law and 2 grandsons age 8 & 6. We are looking for a lily so similar. We are at home all day, haxe a house with a secure garden, love to walk, live at Siglap.. Thank you so much for your kind message. We are having so much fun with Lily. She is a funny and very smart little girl. Have fun with your dear little doggie! Lily is adorable and I am so glad she has a chance at a great home. 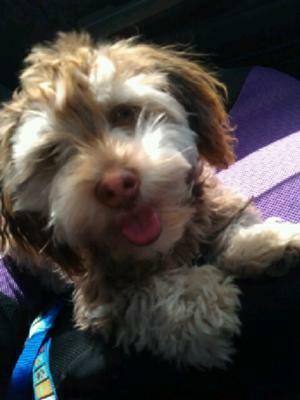 My maltipoo was a rescue and in need of a good home also and we just adore her. She's got the best personality. Good luck and God bless. Have fun with your new addition Lily. she's beautiful good luck w/her! 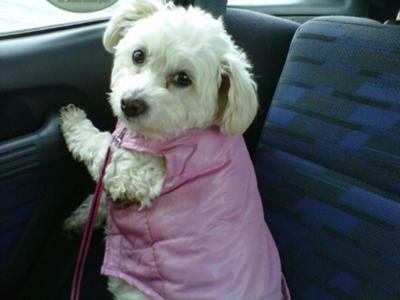 Molly is a 6 year old Maltese Poodle rescue dog. She is a rescue from the local animal shelter, so I'm not sure of her exact age. She has been with me for 2 years now. Molly is a wonderful, adaptable, dear friend. She loves everyone, even my cats. 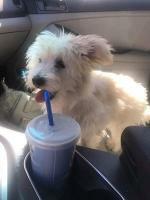 Maltese Poodle likes to go for long walks and rides in the car, and she pretty much comes everywhere with me! I am so happy that we found each other! 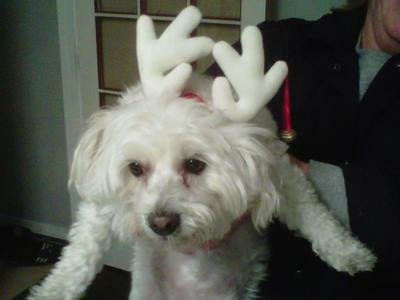 We just lost our beloved Rosie ( 10yr old Coton)..Need a female maltipoo, 2-4 years old, under 10lbs; prefer gray and white..Live in Woodland Hills, Ca.91367. I rescued Indie from the dog pound, but reality is that Indie rescued me. My Maltese Poodle rescue was found in a ditch as a stray probably because she has a huge under bite and the puppy mill didn't think they could sell her. I wouldn't give her up for any amount of money. I had moved to Texas 6 months earlier and was cleaning the moving blankets out of the garage. I decided to donate the blankets to the local shelter. When I got there, I did a tour and saw Indie. Her shelter name was "Shakey" because she was so scared and shook constantly. I couldn't leave without her,even though my husband and I had decided to be "dog-free" after raising two awesome dogs during the past 30 years. He fell in love with her immediately. 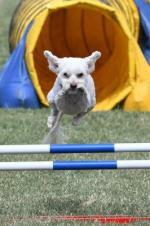 Our Maltese Poodle has brought fun and happiness to our new life in Texas. She goes everywhere with us. I can't imagine life without Indie. 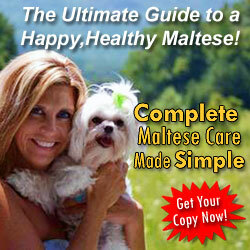 I lost two malti-poos to a house fire, a father and a daughter. The mother was in the back yard at the time and I had her another 2 years before some jerk hit her with a car and killed her in front on my home. All three of them were the most wonderful fur-babies, snow white with just some cream on their ears. How I would LOVE to have another sugar baby. They had the most wonderful personalities and were so loving. The fire dept, had them cremated for us and we still have Pat Pat and Minnie'S ashes with us as well as Prissy's collar. I miss them EVERY day! 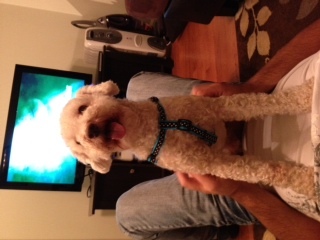 We adopted a beautiful poodle mixed dog. she was the best ever. Died suddenly of a heart condition. Looking for a female dog five years or under. We are retired and took our little Gracie with us to restaurants, car trips, and to family and friends. Everyone loved her. Maltese Poodle breed seems to capture all the loving features - loves companship, loves to be cuddled and likes to run the house. If one comes available, we would love to be notified.